Last week I was asked by a friend if I had an easy macaroni cheese recipe that I could pass on to them as it is one of their favourite meals. I also love macaroni cheese but haven't cooked it in a long time, probably due to the fact that Nicola doesn't see this as a proper meal. As luck would have it, Nicola has had to travel down to London for a few days with her work, leaving me in a position to cook whatever I want over the next few nights so after dropping Nicola off at the railway station, "Operation Macaroni" was put into place. Cook the macaroni to packet instructions then drain and set aside. Heat a little oil in a pan before adding the bacon and frying for a couple of minutes before adding the leek and garlic. Continue to fry the contents of the pan until the bacon begins to crisp and the leeks begin to soften. Remove from the heat and set aside. To make the cheese sauce, melt the butter in a pan and add the flour when the butter begins to bubble. Cook the roux for 2-3 minutes before adding the milk, remembering to whisk continuously to avoid lumps. Keep stirring the sauce until it thickens, this could take up to five minutes, then remove from the heat and stir in the grated cheddar and Grana Padano. Do not put your cheese sauce back on the heat as this will cause the sauce to become stringy. 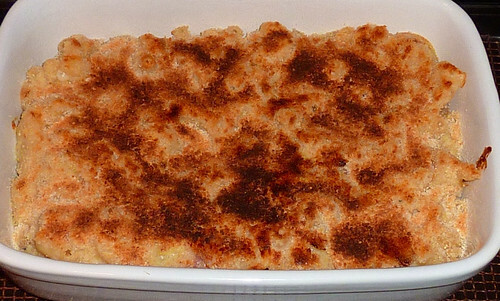 Mix the cooked macaroni, bacon, leeks and garlic into the cheese sauce then place in an ovenproof dish before sprinkling the breadcrumbs over the top. Place the dish in a preheated oven 180C, and heat through for 15-20 until the breadcrumbs are golden in colour. The resulting dish was so more-ish. 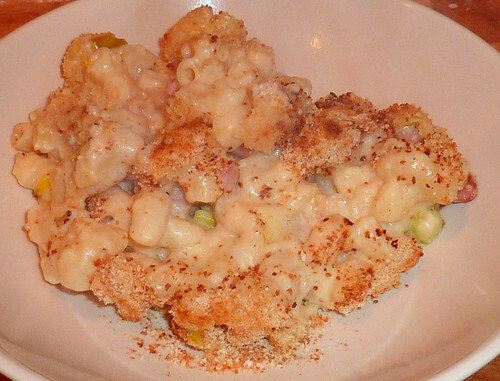 My cheese sauce was deliciously creamy and the bacon, leeks and breadcrumbs added a great mix of textures. The combination of flavours that you could add to the macaroni is endless, why not throw in some sun-dried tomatoes and torn basil leaves, or spicy chorizo? In fact, I'm already wondering what I'll add to my next batch, although I better cross my fingers that Nicola has another work trip scheduled soon!